An editorial from April 1st, in the Wall Street Journal written by functionary in the wind industry speaks his mind about the flood of federal subsidies for wind turbine development. Its worth a read and prescient to the experience across the country of people finding the development of wind power taking a turn down the old slippery slope of greed. The wind industry has woven itself into the hearts and minds of most Americans who remain unaware of the environmental hazards that the current designs of wind turbines present. In addition, as the writer, Patrick Jenevein says in his own words, the industry has, in their hunger for profit, forgotten their original mission which was in fact to assist in preserving our planet from further industrial destruction. Wind Power Subisidies – No Thanks! The sequester has led to dire warnings from many camps, including advocates of clean energy, who argue that Washington’s modest cuts could derail America’s green future. 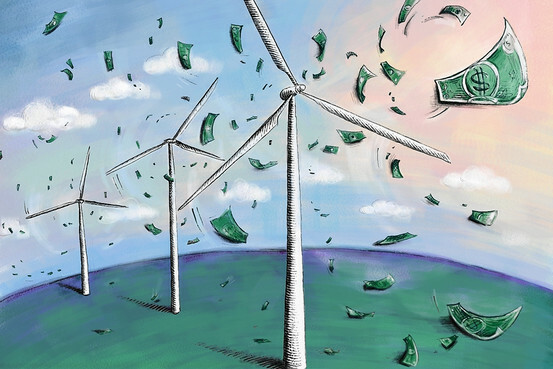 But from my vantage as a CEO in the wind-power business, the sequester offers Washington a rare opportunity to roll back misguided subsidies and maybe help reverse wind power’s stalling momentum. Since 2009, as part of the president’s stimulus, wind-farm developers have been able to get a federal cash grant or tax credit covering up to 30% of their capital investment in a new project. This is especially attractive compared with another tax credit that rewards wind farms based on how much power they actually produce. Through May 2012, according to the National Renewable Energy Laboratory, Washington spent some $8.4 billion on these cash grants. But under the sequester, Uncle Sam is cutting the cash-grant program by 8.7% between March 1 and Sept. 30. Advocates of clean energy should welcome this haircut and urge for even more fundamental policy change. Government subsidies to new wind farms have only made the industry less focused on reducing costs. In turn, the industry produces a product that isn’t as efficient or cheap as it might be if we focused less on working the political system and more on research and development. After the 2009 subsidy became available, wind farms were increasingly built in less-windy locations, according to the Department of Energy’s “2011 Wind Technologies Market Report.” The average wind-power project built in 2011 was located in an area with wind conditions 16% worse than those of the average project in 1998-99. Read more at the site: Wind Power Subsidies? No Thanks!